If you are searching for a Beachfront Florida Hotel, chances are you know about the pristine white beach sand and clear warm waters of the Gulf Coast. Clearwater welcomes guests to the beach and provides a virtual playground for the entire family. Enjoy exhilarating water-sports including sailing, fishing, jet skiing, diving, kayaking, and more! Looking to slow down a little? Not to worry you can always kick back on the beach, enjoy drinks pool side, indulge at the spa, or embark on a romantic sunset cruise. Clearwater is located minutes from the excitement of Tampa Bay, so if you after an urban adventure or looking to catch a sporting event, you are already in the right spot. 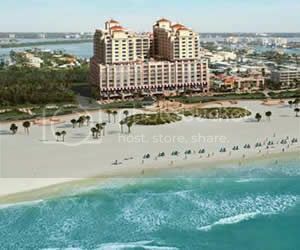 No matter what brings you to Clearwater one of the beachfront hotels featured below are sure to offer what you are searching for. Reserve your vacation today and get ready to have your toes in the soft white sand of the Gulf Coast! Beachfront in Clearwater sits an impeccably crafted Mediterranean inspired resort that ever so gently kisses the warm waters of the Gulf of Mexico. The Holiday Inn Hotel & Suites offers luxurious accommodations and facilities in an equally stunning location. Enjoy gulf-front views, catch glimpses of splashing dolphins, soaring pelicans, and delightful shore birds. Committed to first class service, amenities, and personal attention, relaxing and unwinding will come naturally at the Holiday Inn Clearwater Beach. This beachfront Florida hotel is where you want to be on your next vacation. Snuggly tucked between the turquoise blue water of the Gulf and the refreshing Coastal Waterway, this hotel is the only beachfront Hyatt on Florida's entire west coast. Combing contemporary West Indies style and classic Florida luxury, the Hyatt Regency Clearwater Beach Resort and Spa is a beachfront retreat that will allow complete relaxation for all guests. If it's adventure you seek, enjoy an array of water-sport or treat yourself to a round of golf. No matter how you plan to spend your beachfront Florida vacation, the Hyatt Regency is a worthy destination that must be considered. At the Sandpearl Resort in Clearwater Beach, nothing stands between guests and the soft powdery white sand of the Gulf of Mexico. This beachfront AAA Four Diamond award winning hotel is more than just a vacation destination, it's a place where couples fall in love all over again, families reconnect, and new and old friendship grow stronger. With a beachfront pool, on-site dining, spa, and an array of activities it is possible to spend your entire Florida vacation indulging, rejuvenating and exploring with out stepping off of the resort. Enjoy a world-renowned beach and world-class resort with Sandpearl.